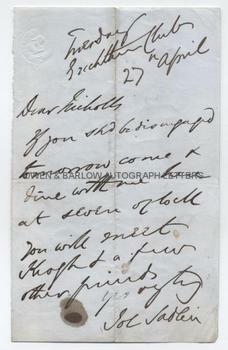 JOHN SADLEIR Autograph letter Signed. Irish Nationalist MP, founder of the Catholic Defence Association, financier, forger and fraudster. ALS. 1p. Drichther [?] Club. 27th April, no year. To "Dear Nicholls". If you should be disengaged tomorrow come and dine with me here at seven o'clock. You will meet Keogh and a few other friends. Yours very truly," etc. 8vo. Approx 7 x 4.5 inches. Lacking integral blank leaf, else very good. John Sadleir was a leading member of the Independent Irish Party which, after its formation in 1852, briefly held the balance of power in parliament. Notwithstanding a pledge not to take government office, John Sadleir and his friend, William Keogh, did so and this was seen as a betrayal of the Irish cause. Thereafter, the phrase "to be a Sadleir or a Keogh" entered the Irish political language as being synonymous with a traitor or political turncoat. In 1854 John Sadleir was forced to resign when he became implicated in a plot to imprison a customer of his Bank who had refused to vote for him. It then transpired that Sadleir had milked the Tipperary Bank to fund his own ruinous debts. He had also sold forged railway shares, raised money on forged deeds and embezzled money that he had held as trustee. A ruined man, he committed suicide on Hampstead Heath by drinking a bottle of prussic acid. John Sadleir was the model for several fictional characters including Charles Dickens's Mr Merdle in 'Little Dorrit', Anthony Trollope's Melmotte in 'The Way We Live Now' and was the inspiration for W S Gilbert's play 'An Old Score'. 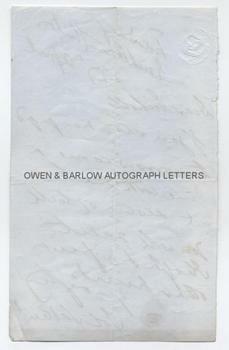 Due to his relatively early death, letters of John Sadleir are uncommon. The mention of his confederate William Keogh makes this example particularly pleasing.